Turkish President Recep Tayyip Erdogan met with his German counterpart Frank-Walter Steinmeier on Friday to discuss ways to improve political and economic relations between the two countries, Anadolu Agency reports. Erdogan was received with military honors by Steinmeier at the presidential palace Schloss Bellevue. 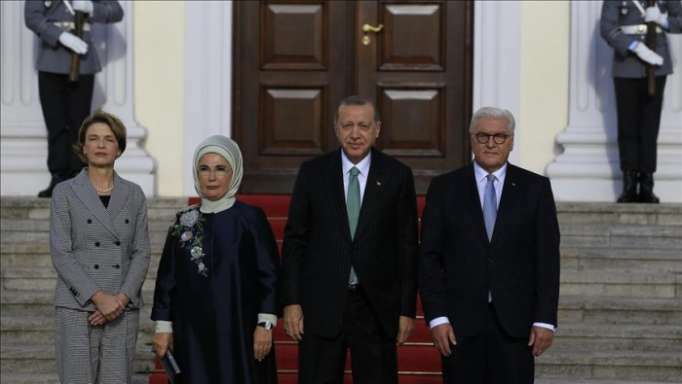 The president and First Lady Emine Erdogan arrived in Berlin on Thursday for a three-day state visit. Erdogan is scheduled to meet with German Chancellor Angela Merkel later on Friday. Ahead of his visit, Erdogan called for opening a fresh page in Turkish-German relations, in an article published in German daily Frankfurter Allgemeine Zeitung. “The dramatic developments in the world make it indispensable for both Germany and Turkey to open a new page in bilateral relations, to leave aside their differences and focus on their common interests,” he stressed. German authorities have raised security measures to the highest level, 1+, in Berlin’s city center ahead of Erdogan’s visit. Berlin police announced that around 4,200 police officers would be deployed in Berlin to ensure the security during the visit. Main streets in the government district were closed as part of the security arrangements. Following his official meetings in Berlin, Erdogan will travel on Saturday to the federal state of North Rhine-Westphalia, which has a large Turkish immigrant population. In Cologne, Erdogan will attend the inauguration ceremony of Cologne Central Mosque, run by Turkish-Islamic Union for Religious Affairs.